Here’s a confession for you. When I was in middle school, I was THE BIGGEST Star Wars fan ever. I lived and breathed Star Wars. I watched the movies almost every weekend, I owned ever single book, I knew all the bizarre trivia. To my great shame I saw The Phantom Menace not once, not twice, but THREE TIMES in the theaters. I handwrote a 400+ page fanfiction in the Star Wars universe on college ruled loose leaf paper with my best friend at the time. From 6th to 8th grade, all I did was Star Wars. Unfortunately, it made my life a complete living hell in school. I moved around a fair amount as a child and I started 6th grade in a brand new place with brand new braces and a brand new terrible haircut. I was screwed. I was also the youngest in my grade, due to skipping half a grade before we moved. Once they got wind of what a giant nerd I was, I was a goner. It was blood in the water and middle school kids are great whites. I suffered some of the worst bullying of my life there so when we moved again at the beginning of 9th grade, I decided to completely do away with the number one thing that made me a target: Star Wars. In the move, I got rid of everything. All the books, all the posters and toys and magazines. I completely purged myself of Star Wars. When asked by people in my new high school if I had ever seen Star Wars I lied and said no and that I wasn’t really into science fiction that much. I shifted my interests to fantasy and horror, stuff like Harry Potter, Neil Gaiman, Anne Rice and HP Lovecraft. I got really intensely into music. I dabbled in anime. In college I rediscovered science fiction with Firefly and Doctor Who, but I was 100% done with Star Wars. Just thinking about it was enough to make me sick with anxiety. My intense obsession turned into aversion very quickly. As late as this past Christmas I was completely unable to even discuss Star Wars without slightly freaking out. My mother discovered an old Princess Leia Christmas ornament as we decorated our tree and I laughed and quickly shoved it to the bottom of the ornament box and swiftly changed the subject. Anytime Star Wars came up, I felt this intense rush of EMBARRASSMENT and SHAME. I love cartoons. I love them to death. I’m also a little lazy. Lately, Disney XD has been showing my current favorite cartoon, Gravity Falls, with an episode or two of Star Wars Rebels in between. If a four hour block of Gravity Falls was interrupted by a half hour of Star Wars Rebels, I wasn’t going to be bothered to change the channel. Often I muted it, or went and did laundry or something. Soon I forgot to mute it. I began to see the same episodes over and over again. I started to… kind of like it? The animation is godawful. Seriously, Disney should be ashamed. But the characters are fascinating, the enemy is fun as hell, and it’s funny. It doesn’t FEEL like the Star Wars I remembered. It’s more carefree, more about these personal stories instead of a huge galactic war. The Force doesn’t feel hokey, it feels more like a fairly decent plot point. I began to enjoy myself. 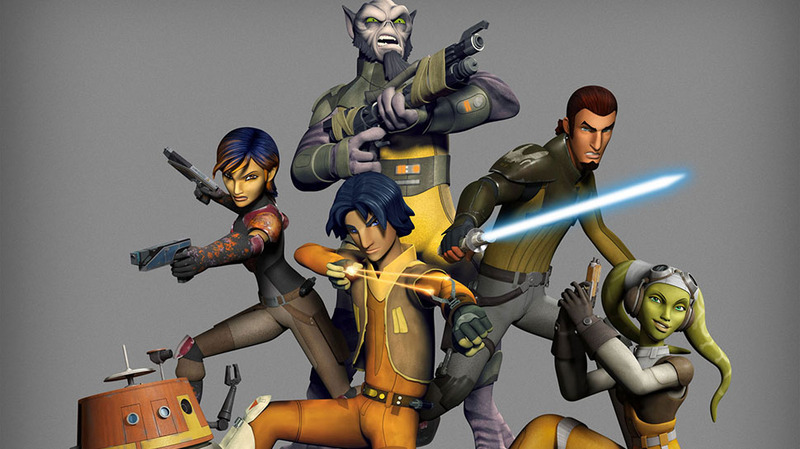 Star Wars Rebels is like Firefly with a Star Wars coating. Its rebels and misfits eking out an existence and trying to do what’s right. Honestly, most of the time it doesn’t even feel like Star Wars. It’s nice. The only time I felt that sharp stab of embarrassment was when R2-D2 and C-3PO showed up because it instantly reminded me that it was Star Wars. Despite that, their episode was kind of adorable. I doubt in the future I’m going to be a huge Star Wars nerd again. I’m not going to get into big internet arguments about the Disney universe vs the old expanded universe (personally, I think getting rid of all the old expanded stuff was probably a good thing). I may not even see the new Star Wars movie in theaters but I’ll probably check it out at the Redbox. I may buy a Funko Pop Darth Vader. I might make more Star Wars jokes (mostly I like to joke about Hoth and tauntauns because it’s February on the East Coast and the high tomorrow will be 12 degrees). Honestly, I may never watch the original trilogy again. I never saw the other two prequels and I doubt I’ll watch them even now. But I feel like I can move forward from a place where the mere mention of Star Wars made me cringe. I won’t be nauseous with anxiety anymore and it’s all thanks to a terribly animated little show I began to watch only because I was too lazy to change the channel.